Is it hard to model your system in all its complexity? Is it hard to work out root causes to identified problems? Is it hard to predict how long work will take? If yes to any of these, the chances are, you’re working on a complex system. Complex systems display emergent behaviour. An emergent system’s behaviour is created as a result of interactions of its parts. Marriage is an example of a complex system built on two independent complex systems contractually agreeing to become one system. Two persons coming together to form a new system creates a new set of emergent behaviours unique to either individual. Who knew? Bringing this back to quality. 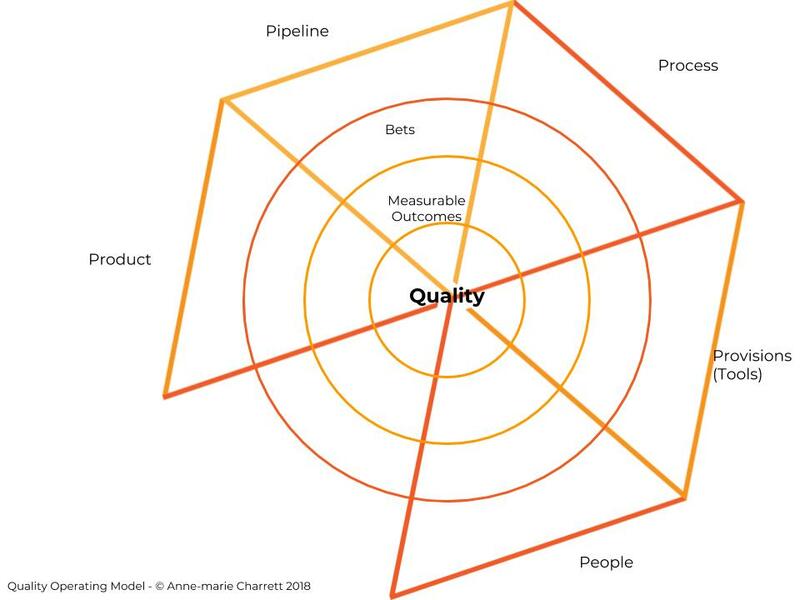 Why is it so hard to understand, define and measure quality? If we consider that even our greatest intellectuals don’t agree on a definition of quality, then perhaps we don’t need to feel so bad about knowing what it is. My hypothesis is that quality is an emergent behaviour. It relies on a whole set of independent systems coming together to create this emergent property. We can never truly know what quality is. It’s constantly changing and morphing into different things. For sure, we can provide examples, but know quality itself? I’m not convinced. And perhaps we don’t need to know. Perhaps instead we focus on creating a space where quality naturally emerges. To do that it needs a collective framework where people, processes, pipelines product and provisions (tools} working cohesively to create a space where quality emerges in a way we want it to. We manipulate quality by manipulating the parts that can impact final product quality. One example of manipulating a part might be psychological safety in a team. Research within Google has identified psychological safety can have a major impact on team effectiveness. Experience of working with teams has shown me that how a team operates can have an important impact on the emergent quality of a product. There’s more to say on this, but this *is* meant to be a short blog post. In summary, we should not forget the consumer in this equation. The consumer has the final say on what quality is (see Peter Drucker quote below). Understanding our consumer starts with better listening. Understanding our own bias that prevents us from listening properly. Consumer’s needs change as their desires and demands change. What worked yesterday, doesn’t necessarily work today. Let’s create an environment that foster’s understanding and willingness to walk with our consumers, and work in a coherent way that works to achieve that. Quality is indeed value to some person at some point in time …. Emergent Quality by Anne-Marie Cjarrett is licensed under a Creative Commons Attribution-NonCommercial-ShareAlike 4.0 International License. Based on a work at https://mavericktester.com/2018/12/04/emergent-quality/.